Cardiff Blues have added to next season's exciting back line with the signing of Wales wing Hallam Amos. Amos, 24, joins the Blues after eight seasons with the Dragons during which he made more than 100 appearances and won 19 international caps. Amos joins fellow Wales wing Josh Adams at the region in the summer. "I am getting to the stage of my career, especially with my degree nearing its end, where I will benefit from a fresh environment," said Amos. "I've been involved in the Dragons set-up for a decade and I am so thankful to them for giving me my first opportunity as a professional. "They have been brilliant in allowing me to combine rugby and my medical studies and I will leave Rodney Parade with lifelong friends. "My decision to leave is no reflection of what is being built at the Dragons, as the direction the region is going is positive." Former Wales and Dragons forward Andrew Coombs has criticised the region for allowing Amos to leave. He said the Dragons are "going backwards" and it is "very concerning" they are leaking talented players to their rivals. "Three years ago they were winning at least six to eight games a season and now they're losing more games and continuing to lose influential international players," said Coombs. "Hallam Amos is a massive loss, probably the best back the Dragons have in their team." Coombs added: "It's exciting for the Blues bringing in Josh Adams as well. They've signed some real quality players and it's just a shame the Dragons haven't been able to develop as a region. "Two years of pretty sorry times again, losing head coach Bernard Jackman and then continuing to lose talented players." Amos said he enjoys playing at the Arms Park and is looking forward to competition for places which he hopes will "help me take my game to the next level". "It is already such a strong area and I have already played with the likes of Matthew Morgan, Jason Harries and Aled Summerhill, while I know Owen Lane," he said. Blues head coach John Mulvihill said: "Hallam is a hugely impressive man and a very talented wing and full-back who will really thrive within our competitive environment. "It gives us real strength and depth and a competitive edge in our back three. The signing of Josh Adams and now Hallam will bolster and really complement our already exciting back three." 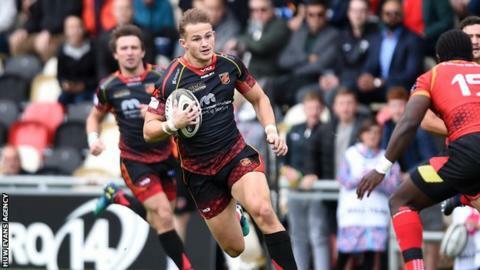 Dragons head coach Ceri Jones said Amos has been "a fantastic servant". "A man of the region, he's been a stand-out talent, so we respect his decision and we wish him well for his next chapter in his career. "We all hope Hallam gets his chance to shine for Wales in Japan."